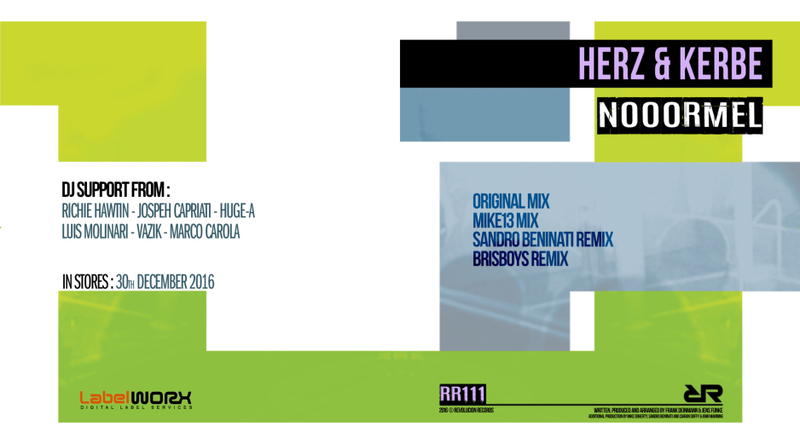 As another successful year draws to a close the Revolucion Records crew are set the end year on a high with their final release of 2016 and the label debut from their highly rated German duo Herz & Kerbe. Already gaining rave reviews for their superb 'Disco Lies EP' which spent more than 14 weeks on the techno charts and in the playlists of many elite players on the global techno scene, the pair were soon snapped up for their tech house cracker 'Nooormel' featuring Revolucion's very own Mike13 alongside highly talented Italian star Sandro Beninati and Belfast duo Brisboys on remix duty. Written, arranged and produced by Frank Deinmann & Jens Funke. Additional production by Mike Doherty, Sandro Beninati and Ciaran Duffy & John Manning.